Last week I had the opportunity to visit the William States Lee College of Engineering at the University of North Carolina at Charlotte (UNCC). Behind the impressive, collegial exterior sits a surprising and welcome treasure trove of engineering goodies including 5 rapid prototyping machines, several full workshops of CNC and milling machines, a Precision Metrology division, and tucked away behind the main building is the Alan Kulwicki Motorsports Laboratory. This makes for an exciting place for visitors and students alike. Even in the summer months, the workshops and labs remain busy, overbooked engineering courses continue on, and the engineering degree courses see some 800 students a year. 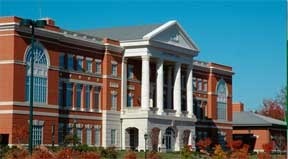 Situated in the heart of NASCAR country, UNCC is delivering top class engineering studies at all levels. 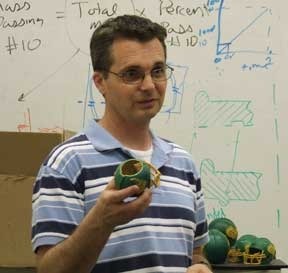 Dr. Jeff Raquet is a senior lecturer at the college teaching Mechanical Engineering and Engineering Science. His years of experience with PTC's Pro/ENGINEER software means that he now leads the CAD foundation for their design-intense curriculum, which take budding engineers through the entire concept, design, engineer and manufacture of parts and products. To do this successfully, Dr. Raquet uses a range of 3D scanners, Geomagic Studio software, Pro/ENGINEER and rapid prototyping systems from Stratasys and ZCorp. "While we teach people how to operate the software, our actual focus is on them learning how to be successful in the entire design-to-manufacture process," said Raquet. "This means that they learn all the tools available including 3D scanning, reverse engineering, working in CAD software, all the way through to operating the RP, CNC and milling machines. In so doing, they learn how their designs can, and perhaps cannot, be manufactured." According to Raquet, Geomagic plays a key role in that process by enabling the students to build new products based on existing or old parts, and has been written into the curriculum for the engineers. "Once the students learn this process of scan, Geomagic and into 3D, it is very interesting to watch how it improves their creativity and performance as engineers," he added. Indeed, Raquet's office is crammed with parts made by students, alongside piles of books on CAD, rapid prototyping and mechanical engineering. The Motorsports Lab is another surprising find. With an old Camaro, which has been turned into a drag race car, on the lift, Dr Raquet walks us through a range of other vehicles for Formula and ASME student competitions which are made by the students. The stock car is conspicuously absent - gone for testing at the track - but activity continues at the Lab. Here vehicles are designed, built, tested and raced. To do this, students use every skill from automotive repair, design, assembly, testing, analysis and improvement. The Lab also utilizes 3D reverse engineering using Geomagic for everything from basic under-graduate studies creating eco-friendly vehicles through to graduate studies in stock car and drag race car performance. The engineering courses at UNCC are highly popular and are known to feed the variety of NASCAR industries which populate the Charlotte, NC region (many of whom also use Geomagic, we are glad to note!) We hope that the college continues to build on its vision and see continued success.